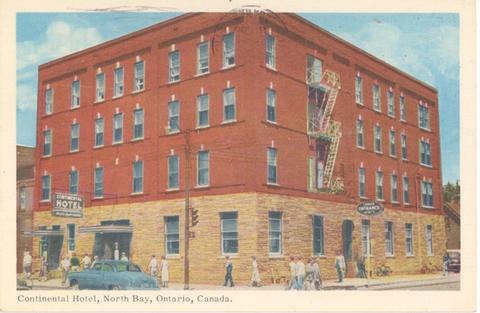 Item 073 - Continental Hotel, North Bay, Ontario, Canada. Card was cancelled (location illegible) 17 July 1937[?]. Message reads: "Have bought my ticket to Calgary and from there to Banff. Arrived about 8:35 pm. It is now 7a.m. Wed - (daylight) we arrive in Sudbury in 25 min. Every seat taken. a nice woman sitting with me. She is getting off at Pt. Arthur. A lovely morning, was awake before daybreak. Lined [?] up before the gate almost an hour last night. I was near the front. Then what a rush down the platform. I was almost puffing. Have the seat by the window at the right spot and on south side. So everyting is OK. YB"